L'Embrouchure is a leading LUX-camp that is situated in the sunny south of France just a few meters away from a gorgeous sandy beach. One of the great things about this site is that people who arrange a camping holiday will also be granted full access to the range of amenities and entertainment options that can be found at the luxury camping site right next door. What Makes L'Embrouchure So Special? 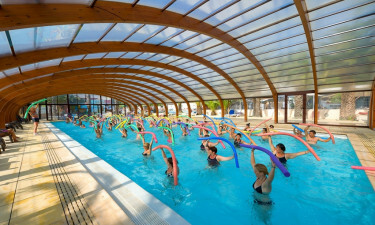 While the beach is the main attraction here, people who can bear to tear themselves away from the sand will soon discover that L'Embrouchure boasts an excellent water park. This is a great place for people of all ages to have fun and the large water park comes complete with several water slides as well as a Jacuzzi area and a separate paddling pool for young children to splash around in. 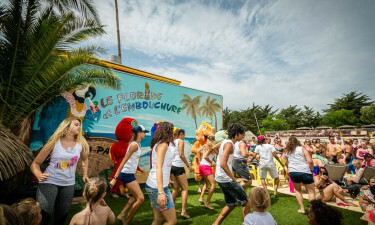 Children who want to have fun and make new friends will be able to join one of the special clubs that are arranged and run by staff at L'Embrouchure. The children’s club is open to children aged from four to eleven years old and contains lots of games, while there is also a separate club just for teenagers. Driving along the road that winds along the coast is an enchanting experience that should not be missed by visitors to L'Embrouchure. A good number of traditional towns and villages can be found close to the coast and these make great places to pause for a bite to eat and explore along the way. Bicycle hire is available at the camping site and cycling is the perfect way to really get a feel for the intense natural beauty of the area. The large onsite restaurant offers guests the opportunity to experience fine dining at its best and sample a range of traditional French dishes. The staff have also put together a rich and varied evening entertainment programme that is sure to appeal to people of all ages and all tastes. Some of the types of entertainment that are included are magic shows, live music, special casino evenings and comedy evening. There is also adult entertainment that can be enjoyed by parents after the kids have been tucked up in bed. People who choose to rent a mobile home at L'Embrouchure will find everything they need to enjoy luxury camping right on the site. The mini market is stocked with a good selection of grocery such as fresh bread, packaged food products and snacks. Whether you want to put together a picnic to eat on the beach, prepare an evening meal or simply sample French snacks, everything is provided. 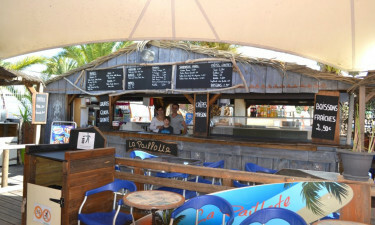 A number of other types of shops can also be found here including shops that sell souvenirs, beach wear and gifts for friends and family at home.